From railway lines to railcars and containers, M2M technology is helping companies stay on the track for safer and more efficient operations. Here are four rail organizations that are leveraging M2M to comply with regulations, optimize processes and grow their business. Elecsys Corp. has enhanced the capabilities of its RFM-100 remote monitoring system that is used to monitor and control both top-of-rail (TOR) and gauge-face lubricators. Now available with 4G cellular and IsatData Pro satellite capability, this solution can continually monitor parameters like power status, tank level, pump “on” time and revolutions, dispensed material volume, main and tank door status, and wheel/axle count. The RFM-100 also has a universal digital interface for connection to a system controller and can remotely enable or disable pump operation for maintenance and repairs. The RFM-100 provides operational data and real-time alerts that are visible through the Elecsys Web application. It is designed to ensure timely repairs and consistent service of railroad wayside equipment, optimize maintenance efficiency and maximize the benefits of wayside equipment investments. Canadian National (CN) Railway uses ORBCOMM M2M technology to remotely monitor interior container temperature to ensure compliance to high food safety standards. The success of the business has allowed the company to expand its cold chain service and invest $20 million to buy an additional 200 refrigerated 53-foot containers for the domestic market and 32 electrical generators to move refrigerated 40-foot international marine reefers. Hub Group, another ORBCOMM intermodal customer, is also investing in its business by leveraging M2M technology. The company plans to install container tracking technology on 80 per cent of its 28,000 53-foot domestic boxes by year’s end. ORBCOMM’s GT 2300 monitors the equipment’s location and detects if the container’s door has been opened or closed. It is also used to determine if the box is empty or loaded, which provides the necessary tools to more effectively match drivers with available containers to increase operational efficiency. With the expansion of the Brazilian rail network and the need to maintain over 30,000 km of tracks, there is a great need for machines that stabilize the ballast layer below the tamped tracks, level the line and ensure the correct geometry of the track. To optimize the operations of these high-value (and limited number of) machines, MOVA, a Brazilian ORBCOMM solution provider, developed a tracking and telemetry M2M solution that uses the IsatData Pro satellite service to monitor these machines. 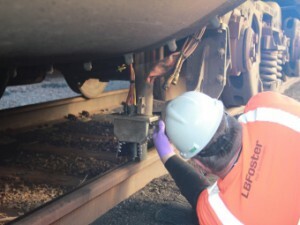 Their solution involves tracking the locations of the ballast stabilization machines as well as monitoring when the machines are used outside normal operating limits. Data is fed into MOVA’s platform where equipment managers can then extract valuable information like hours of operation, idle time and productive time. It can also be used to provide alerts and alarms. The implementation of the telemetry system has enabled the operator to perform remote diagnostics and plan for preventative maintenance that reduces downtime. Anu Sood, Director of Channel Marketing at ORBCOMM, has nearly two decades of expertise in the telecommunications, software development, and satellite industries.